Web Wednesday's foray into new events for the Asian Digerati continues with First 2 Forward, the bilingual game show hosted by the multi-talented MC Hyperlink (Pictured in all his eccentric glory below!). "What is First 2 Forward?" you may ask. MC Hyperlink tells it like this, "It's like a TV game show. It's like a creative department show n' tell. It's like nothing you've ever seen!". Still don't get it? (I didn't at first! ), "First 2 Forward is...Two top creative directors. Five rounds of competition. One event that reveals the freshest, funniest, and freakin' coolest stuff from around the Web". In Cantonese, "First 2 Forward就好像電視遊戲節目一樣，由兩位參加者進行5個回合的比賽，各人需要根據不同的要求，找出最精彩、最搞笑、最貼題的超連結即可。而首次參加比賽的2位參加者均為城中出色的廣告創意總監，且看他們哪一位能勝出首次比賽！"
Tempted? Follow First 2 Forward for the latest updates on Twitter (@first2forward) and come to Match 5 on October 21st (a Wednesday, course!) to watch James Reeves, Creative Director of McCann, battle it out against Jay Oatway (@jayoatway), Tech-Culture Trend Hunter, Digital Journalist, Social Media Evangelist and previous guest speaker at Web Wednesday Hong Kong. We even have a groovy, bi-lingual email invite, designed by MC Hyperlink's creative crew at MRM Worldwide, that goes out to our 1,800+ members. 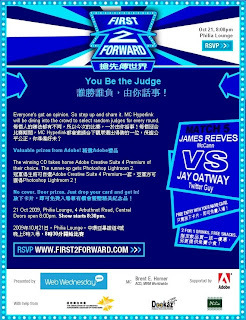 From this month on, First 2 Forward will be hosted at the Philia Lounge, 4 Arbuthnot Road, Central. Doors open 8:00pm. Show starts 8:30pm. Introducing ... celebrity judge crowdsourcing! 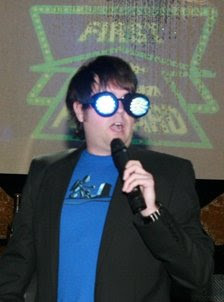 Be ready to say your piece and put up a score because MC Hyperlink will be diving into the audience to select random judges for every round. The nice folks at Questex Media, who publish a wide range of B2B magazines (including Telecom Asia, Network World Asia, Computer World Hong Kong and Enterprise Innovation) and run various trade events and conferences, are offering Web Wednesday members a 20% discount off their upcoming event, AppsXchange Asia. As you can tell from the name, this event will bring together leading lights in the mobile telecoms field to talk about the growing popularity of apps stores and to address the impact of cloud computing on mobile services and business models. If apps are your thing and you want to rub shoulders with the mobile operators, then register here (don't forget to enter the promotion code "WEWE") to attend the two day event on 16-17th November 2009 at the J.W. Marriot Hotel in Pacific Place, Hong Kong. 1st Prize: Gift certificate for dinner at trendy new restaurant SOHO8 with either LUMINA stars JuJu Chan or Michael Chan. Gift certificate worth HKD 888, dinner with actor is priceless! 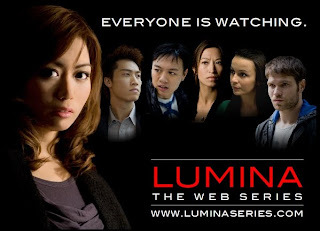 2nd Prize: A walk-on role in Lumina's next YouTube video, featuring LUMINA stars Emilie Guillot and Simon Yin. 3rd Prize: A glossy LUMINA notebook autographed by the cast. Sign up to let us know you're coming by signing up on Facebook or LinkedIn and turn up on the night to drop your namecard and take your first step towards becoming a Web Celebrity.